On September 15th at 8pm I will give a concert at the “Artrium of the Sparkasse Hochsauerland” performing works by Franz Schubert and Sergeij Prokofieff. On August 28th at 11 am I will give a concert at the “C. Bechstein Centrum“ in Hanover performing works by Robert Schumann together with the wonderful conductor Peter Leipold. The young pianist Patricia Hase, born in 1989 in Wiesbaden, is, since 2009, student at the Hanover University for Music, Drama and Media in the master class of Matti Raekallio. She participated in numerous master classes lead by renowned artists and professors, among others: Jaque Rouvier, Einar Steen-Nökleberg, Jura Margulis, Ragna Schirmer, Andrea Bonatta and Irina Edelstein. In the movie for the Germany reunification, on October 3rd 2010, Patricia Hase was portrayed for the ARD and played in four concerts of the “International Summeracademy Mozarteum” in Salzburg, among others in the “Solitär” and the “Wiener Saal” of the old Mozarteum. The close friendship to the conductor Peter Leipold lead both musicians around the world; they gave many concerts, among others with the “Junges Schostakowitsch Ensemble” and the Finish orchestra “St. Michel Strings” in Mikkeli, and played at the International master classes with the “German Philharmonic Orchestra Rhineland-Palatinate”. Patricia Hase has won the nationwide competition “Jugend musiziert” multiple times. Additionally, the young musician won the first prize at the international competition in honour of Robert Schumann, in Zwickau. In 2009, in context of the international competition “Pro Musica Viva Maria Strecker-Daelen Foundation” in Wiesbaden, she received the advancement award for the world premiere of the “Toccata” by E. Schneider. At the international piano competition “Münchner Klavierpodium”, she won several awards, among others the “Piano-Fischer-Preis” Munich, the “Soirée-Piano-Preis” Paris, and the “Chance Festival-Preis” Munich. Patricia Hase holds multiple Drohsin advancement awards. 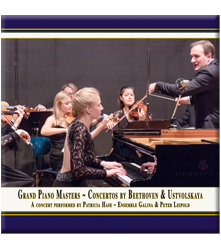 Ensemble Galinas debut-CD with Patricia Hase at the piano consists of Galina Ustwolskajas”Concerto for Piano, Strings and Timpani” and the “Piano Concerto no. 2 in B-Flat Minor” by Ludwig van Beethoven. The CD is available at the KuK-Art Webpage. Enjoy listening to the young pianist perform works by Robert Schumann, Frédéric Chopin, Franz Schubert und Felix Mendelssohn Bartholdy! For more information about the CD and how to purchase it, please follow this link. New and exclusively – now available for download: “Burlesca”, composed by Peter Martin Leipold and played by Patricia Hase as well as further performances by various artists in support of the project: “neu beflügelt”. The download is available at this website.